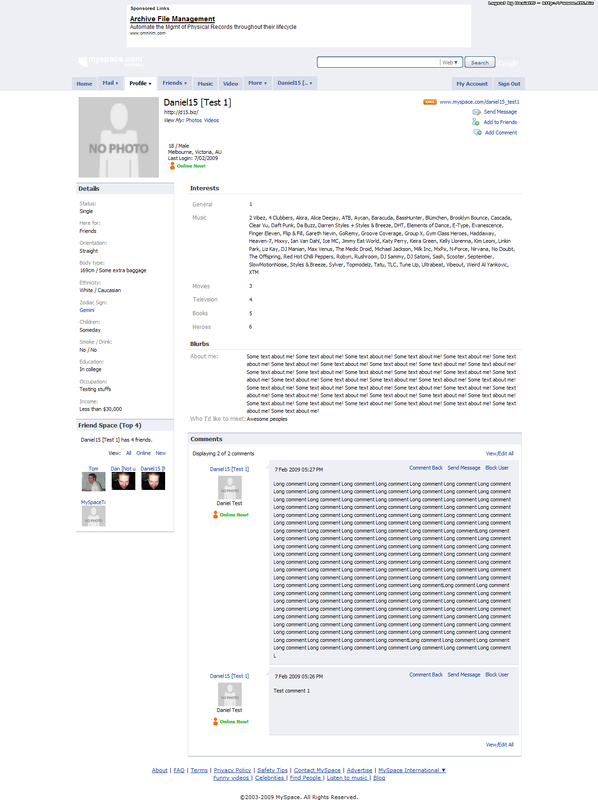 I got bored today and thought it might be fun to make a MySpace profile layout that looks like Facebook. Considering I'm not a designer, I'm rather happy with how it turned out. There's a screenshot to the right, click on it to see a full-size version. I haven't tested in Internet Explorer, but that shouldn't be much of an issue, as most people are using better browsers... Right? Please feel free to use this layout on your profile. The only thing I ask is that you keep the credit (Layout by Daniel15) on the page, and in the CSS code itself. This layout is a profile 2.0 layout. If you haven't already, you'll have to upgrade to MySpace Profile 2.0. This can be done by clicking the "Customise Profile" link in the "Profile" dropdown menu. Go to the "Customise Profile" page. Click "Select Theme" and choose the blank one. Click "Change Layout" and choose a page width of 960px, and the layout with two columns. Click "CSS" and paste the CSS code into the box. Click "Change Layout" again (or any other option. You need to leave the CSS tab and go to another one for it to save the CSS settings). Note I'm giving limited support for this layout. I can try to help you with bugs in the layout itself, but can't help you with anything beyond that. Having said that, please feel free to leave a comment if you find any issues with the layout.